Oh, the healing powers of a good night of sleep! I feel twelve thousand percent better this morning. Yes. Coffee is good. Sleep is better. I have to wonder, would my life be less stressful if I consistently got enough rest? Would I be more creative? Would I be able to tackle the drama of life with more zeal if I simply got more ZZZZZs? I have always pushed the boundaries of sleep deprivation, but I hadn’t made the connection between sleep deprivation and procrastination until yesterday. This morning, I woke up feeling less achy. My mind feels clear and focused. The whole day is still ahead of me, but I feel like I can handle it. Anything’s possible. Did I mention how many days a week I usually run on very little sleep? I would guess at least 5 days out of 7. I feel guilty about all the things left undone, all the stuff I wish I’d taken care of, but hadn’t. I stay up late even though I know I have to get up early for work, etc. The silly thing is, I don’t work on my unfinished tasks. I binge-watch Netflix or read until 2 AM. I procrastinate. Procrastination leads to guilt, which leads to more procrastination. As I wrote out my 3 Morning Pages in longhand, I realized the fears that have been surfacing were virtually gone. My writing was far more creative and upbeat. Freeform ideas and thoughts popped into my head and flowed out onto the pages. This morning, I feel whole. Is this a fluke or is this my body telling me what it needs? The more I explore who I am as a person, the more I feel like I’m discovering shiny tools for my virtual toolbox. Simple tools, but unused until recently. Julia Cameron had a challenge for writers like me, writers who feel blocked, frustrated, guilt-ridden. I’m paraphrasing here, but it’s basically this: if you don’t feel like you can write or you’re avoiding your current work in progress, write one new sentence per day. One sentence. That’s it. Make that your goal. Forget about word counts and writing speed. One new sentence every day is the goal. If you write more, GREAT! Awesome! Do a cartwheel. Dance around the room. Whatever floats your laptop. But one sentence is an attainable goal. No matter how busy you are, you can probably write one new sentence per day. This advice is coming from a woman who’s NOT perfect, who’s written 30+ books, multiple plays and screenplays, song lyrics, poetry…and still makes time to have a LIFE. I’ll admit, I’m having trouble incorporating the ONE new sentence habit into my life. Perhaps I need to announce my intentions to the universe, much like I did when I confessed to my living room clutter. I took care of another tote this morning. My living room project is at the half-way point. Publically journaling my way through it made a difference, made me feel accountable. It’s getting me past my procrastination, to the place I need to be. One new sentence per day would also get me to a path I’d like to be on. I have a vampire series, a story about fairies, a science fiction story, a comedy about the grim reaper/death, all sketched out or partially written. In addition to this, I have notecards filled with other story ideas. I started to write a non-fiction book about my adventures in retail management. I have partially written songs, lyrics only. Since I decided to follow my heart, to become a writer, I’ve never failed to come up with new ideas. It’s the follow through that trips me up. It’s the act of staying with ANY writing project until completion. This year, it REALLY hit me. If I kept going the way I have, I’ll run out of lifespan before I’ll get to share these stories with the world. It’s not a morbid or negative thing. It’s just a fact. We’re only given so many days on this planet, and we don’t know how many we have left. I may have another 41 years left in me. Or not. Regardless, I’d like to be able to say at the end of my days that I lived a full life. I’d like to feel as though my life had purpose and meaning. And JOY! I want my life to have more fun in it. More whimsy. 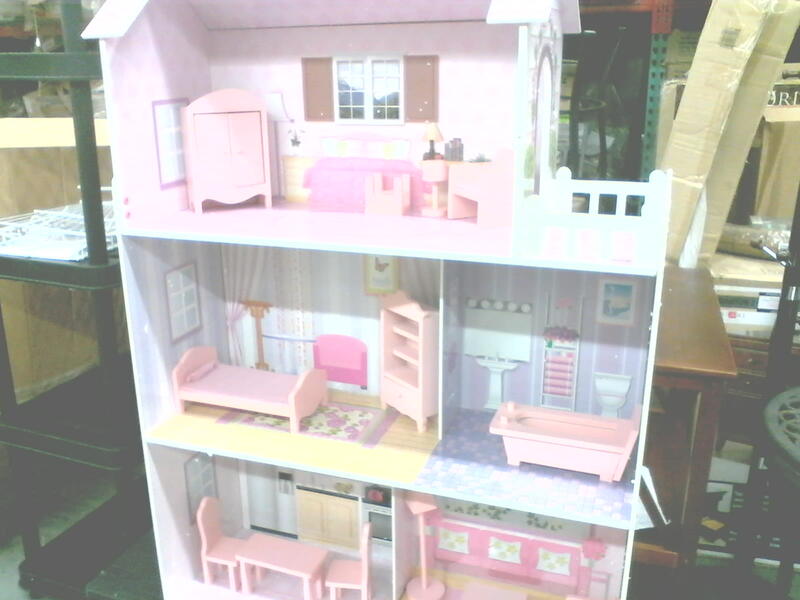 I built a dollhouse at work yesterday. Dollhouse in the back room at work. The child in me was THRILLED! She wanted to play with this house, to use her imagination. Until recently, I haven’t allowed this part of me time for play. She likes putter with paints, to use her creative skills, to use her imagination. Sometimes, I wonder if my writer’s block stems from not allowing this side of myself room to grow. She is stunted, therefore I feel stunted as a person. Perhaps a play date is in order later this afternoon. Good for you! I’m glad to hear the extra sleep made such a difference. Now if I can make myself do the same thing! I love that doll house. You are so creative.